NEW YORK (AP) — For much of the country, the 2018 midterm season is over. But unresolved races for governor in Georgia and Florida are raising major strategic questions for Democrats as they turn their attention to the upcoming battle for the White House. As in other states, Democrats in Florida and Georgia drew record turnout in last week’s election. The coalition of suburban women, young people and minorities delivered the House to Democrats for the first time in nearly a decade. But it wasn’t enough to score decisive victories in the closely watched races for governor in Georgia and Florida, where fresh-faced African-American Democratic candidates for governor trailed their older, white Republican competitors. In Georgia, Stacey Abrams hasn’t conceded her race while Andrew Gillum’s contest in Florida is undergoing a recount. For some Democrats, the lesson emerging from the 2018 midterms is that massive turnout can win suburban House races across New Jersey, Pennsylvania and California. But the coalition that produced some success elsewhere may not be enough in Florida, the nation’s premier presidential battleground state, and Georgia, a state Democrats view with increasing optimism. While Gillum and Abrams have much in common, they ran on different messages. Gillum, the 39-year-old mayor of Florida’s capital city, ran as an unapologetic member of the Trump resistance. He openly called for President Donald Trump’s impeachment. And he accused his Republican opponent, former Rep. Ron DeSantis, of blatant racism. Abrams, the 44-year-old former minority leader in Georgia’s House of Representative, highlighted her bipartisan credentials throughout her bid for governor. While she and Gillum embraced liberal policy priorities, such as “Medicare for All,” she promoted her work with Republicans in the state legislature, even highlighting a handshake with GOP Gov. Nathan Deal in a campaign ad. Still, both were viewed as rising stars within the evolving Democratic Party, a new generation of Democratic leadership that could expand the party’s appeal among all voters. Racial divisions appear to have limited their appeal, however. Both Gillum and Abrams won African-Americans and young voters by overwhelming margins. But they struggled with older, white voters, particularly noncollege-educated white voters, who make up the core of Trump’s political base. Gillum won 92 percent of black voters, according to VoteCast, a wide-ranging survey of the electorate conducted by The Associated Press. He also won 60 percent of voters 18 to 29 years old, and 54 percent of women. But Gillum earned just 44 percent of the male vote. And he won only 39 percent of the overall white vote — and 35 percent among noncollege-educated white voters. 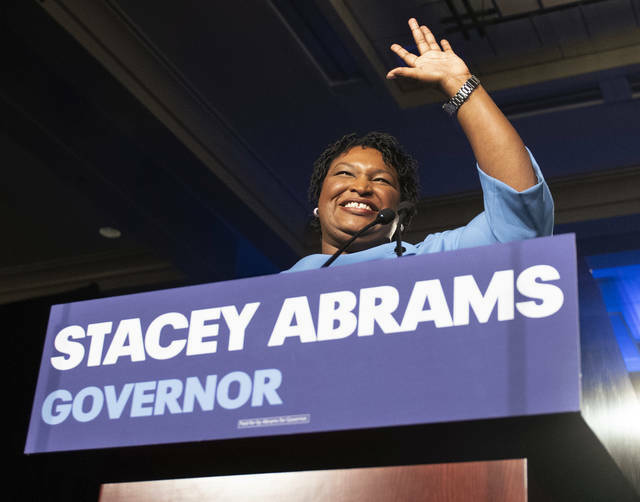 It was worse for Abrams, who was poised to become the nation’s first African-American female governor. She won 94 percent of Georgia’s black vote, but just 25 percent of white voters. She carried 56 percent of women, but just 40 percent of men. A dismal 19 percent of noncollege-educated white men supported her, according to VoteCast. Nationwide, 43 percent of white voters backed Democrats, including 38 percent of noncollege-educated whites. The results “absolutely” demonstrated black candidates like Gillum and Abrams have a harder time winning in the Trump era, NAACP President Derrick Johnson told the AP. Leading Democratic pollster Stan Greenberg agreed that racism likely shaped the elections. “This was a big election in which the president used immigration to send a kind of racist message about the need to stand up whites against the invasion,” Greenberg said of Trump’s final-days focus on a caravan of Latin American immigrants heading to the U.S. border to seek asylum. Greenberg acknowledged Democrats’ nationwide struggle among working-class white men, but he highlighted Gillum and Abrams’ ability to drive tremendous turnout overall. With votes still being counted, Gillum received more than 4 million votes, shattering the previous midterm record set in 2014 by Democratic gubernatorial candidate Charlie Crist, who earned 2.8 million votes. 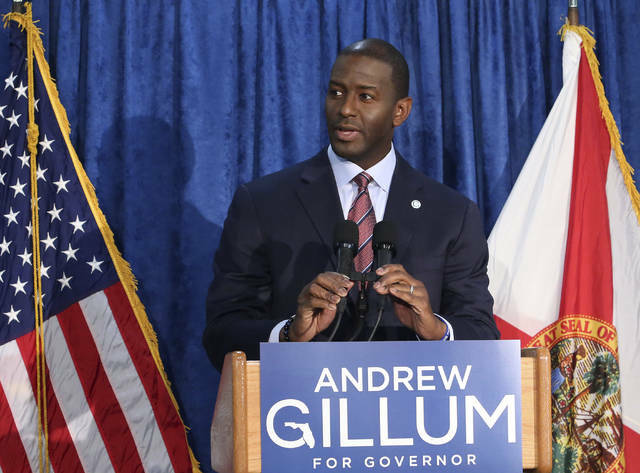 While significantly fewer voters typically participate in off-year elections, Gillum came close to matching Democratic presidential nominee Hillary Clinton’s 2016 total of 4.5 million votes. It was much the same in Georgia, a smaller state, where Abrams actually exceeded Clinton’s 2016 vote total, earning a midterm Democratic record 1.9 million votes. But so far, at least, the Republican candidates in both states earned more votes. The dynamic does not bode well for Democrats’ fight to deny Trump a second term, even as America grows more diverse. Schale said Democrats in Florida and Georgia — and others — must do a better job managing their losses among voters in Republican-leaning regions, which are increasingly turning away from his party. It’s unclear, however, how exactly to do that. It is clear after these past mid-terms we need the United Nations to monitor our national elections to make certain they are democratically fair. Indeed, the elections proved Americans can be both progressive and regressive. Not only were there voting irregularities on voting day—machine breakdowns, loss of power, long voting lines, voters turned away at polls—but there were significant efforts at voter suppression as well. When Republicans claim “fraud” in the voting process, the political strategy is to limit or even purge potential voters who may vote for the Democrats. In the history of our politics, fraud was evident when a voter may have voted more than once, or a dead person’s name was used for voting. This happened most infamously in corrupt politics in the mid-to-late nineteenth century New York with Boss Tweed and his Tammany Hall Democrat-party machine. In a 6-2 ruling, the US Supreme Court upheld a lower court in October, which required Native Americans to have proof of an actual street address in order to be able to vote. In rural Native reservations in North Dakota, there are most often no street addresses. This is no fault of their own. The Native reservations were never designed with street addresses in mind. This was never a voting issue in North Dakota; Native Americans on any of the six large reservations have always just used P.O. boxes and they could vote. Then Heidi Heitkamp, a Democrat, won six years ago by small margins. ND Republicans knew she had the general support of the Native community so they passed a law requiring voters to have an ID with a street address. Unfortunately, this is not a unique case. Efforts are being made across the country to suppress the vote. Since 2010, according to the Brennan Center for Justice, there have been 24 states which have introduced measures making it more difficult to vote. This new restrictive-voting legislation includes: more rigorous requirements of photo IDs, more limitations on early voting, and more stringent obligations on voting registration. Arguably, even though the Constitution declares it a right, many state officials are treating voting as a privilege. The difference is significant. States must legally justify restrictions on rights but not so on privileges. Voter suppression in general damages our democracy. The more people we include in our democracy, and by giving more people the right to vote, the more representative government we have. Moreover, democracy is not simply about protecting the majority or how the majority rules but rather providing safeguards for our minorities as well. Voting suppression is reminiscent of the “Jim Crow” South when it was acceptable to require African Americans to pay a “poll tax” in order to vote. Or, enforcing “grandfather clauses”—such as if your grandfather could not vote, neither could you. (For African-Americans who were former slaves, their grandparents were not allowed to vote!) And perhaps, worst of all, there were the impossible to pass literacy tests. Today, in Georgia, the Secretary of State, Brian Kemp (R), who also happens to be running against the African-American, Stacey Abrams (D), for governor—used his office to put 53,000 voter registrations on hold. At least three-quarters of these potential voters are African-Americans. Kemp (R) has further raised the issue of fraud against the Democrats accusing them of hacking into the state’s voter registration system without any evidence whatsoever. Governor Rick Scott (R) in his Senatorial bid has also cried foul, calling out “radical liberals” for spoiling the electoral process, especially in Broward and Palm Beach Counties. Such sentiments have been echoed by the President, when Trump cried foul about Hilary Clinton for rigging the 2016 election and the popular vote, utterly false claims seeming to misdirect from his own questionable machinations. What is more, the first Native American women were elected to the US Congress, Sharice Davids (D-Kansas), Ho-Chunk Nation, and Debra Haaland (D-New Mexico), Laguna Pueblo People. The first Muslim-American women were also elected to the House of Representatives, Ilhan Omar (D-Minnesota), a Somali-born refugee, and Rashida Tlaib (D-Michigan), Palestinian-American. For the first time in US history an openly gay person will serve as governor of a state, Jared Polis of Colorado. Additionally, the youngest woman to serve in the US House of Representatives was elected, Latina, Alexandria Ocasio-Cortez (D-New York) at 29 years old. In sum, it is important to be hopeful about our elections. At the same time, we need to be wary of political strategies which are undermining our democracy and limiting our right to vote. Trump’s latest call for removing the 14thAmendment from the Constitution is just the most recent political installment of this drama. In other words, newly born new immigrants (so-called illegals) should not get the same rights according to the Trump administration. And if necessary, it is time we ask our elections be monitored by international observers like the United Nations to make them free and fair for all. PARIS (AP) — Canadian Prime Minister Justin Trudeau on Monday became the first Western leader to acknowledge his country had heard recordings of the killing of Saudi writer Jamal Khashoggi. Hunt — the first British minister to visit Saudi Arabia since Khashoggi was killed — said he would press the kingdom to fully cooperate with a Turkish investigation into the writer’s killing. Associated Press writers Aya Batrawy in Dubai, United Arab Emirates, and Sylvie Corbet in Paris contributed to this report. The Department of Defense’s recent report on the defense industrial base telegraphs a dangerous direction for the White House. This message to our country relies on alarmist rhetoric and archaic myths to drum up support for protectionist and crony-capitalist policies. This is bad news not only for taxpayers but also for economic prosperity and American security. This White House’s protectionist policies generally do not improve national security or the defense industrial base. Instead, they tend to promote cronyism, monopolize weapons procurement, slow economic growth and strain relations with allies. Simply put, when politicians get to pick winners and losers in the marketplace, they do so based on political expediency, not what’s best for security or the economy. This usually leads to taxpayers footing the bill for overpriced, flawed or unnecessary weapons systems supposedly produced by “key” manufacturers or industries that seek government protection against alternative technologies or foreign suppliers. Such policies generally do not improve national security, but they do help explain why the Army is burdened with more Abrams tanks than it needs in order to keep Ohio’s tank factory in business; or why taxpayers pay to ship Pennsylvania coal to power U.S. military facilities in coal-rich Germany; or why the military is forced to buy domestically produced sneakers, tarpaulins and American flags at inflated prices; and a litany of other offenses rooted in political calculations. Contrary to Trump administration’s alarmist claims about America’s ailing industrial base, figures indicate that the industrial base is as large as ever and has been growing at a fast pace. Moreover, this growth in industrial and manufacturing production, as well as gross domestic product, goes hand in hand with increased U.S. arms and total trade with the rest of the world. In this globalized world, it is virtually impossible to produce an advanced weapons system without foreign suppliers. Take the American F-16 fighter jet, for example. It is the most popular fighter jet in the world. Built using a mixture of high-tech components from Germany, Israel, Japan and Russia as well as less-costly, commercially available components from Brazil, Poland, South Africa and Spain, this plane is a great value for money thanks to free trade. International collaborations like the F-16 project exemplify the benefits of free arms trade that enable the United States and its allies to maintain national security without breaking the bank. To be fair, the Pentagon’s industrial base report does make some risk assessments and recommendations to improve military contracting practices that are laudable. But the thrust of the paper is devoted to justifying protectionist economic policies that will be bad for taxpayers and, much worse, bad for American national security. Attempts to restrict international trade through policies like tariffs on aluminum and steel will only make the U.S. industrial base less productive and the economy less prosperous. In turn, a less productive and prosperous nation is less able to feed and defend itself. Since the days of Adam Smith, economists have argued that free trade makes nations more prosperous. Free-trading nations tend to be more prosperous and peaceful, more technologically advanced, and more capable of defending themselves. Strong economies make for strong defenses. This should elevate looming threats like trillion-dollar deficits and an entitlement spending crisis as the national security threats they are. Legislators should put fiscal prudence and national prosperity ahead of favored, politically connected firms. Continued regulatory reform, reducing government spending, and pursuing free trade relationships, is the best way to maintain a robust manufacturing sector and supply chain. Pavel A. Yakovlev is an associate professor of economics at Duquesne University and an associate fellow of the National Taxpayers Union Foundation. He wrote this for InsideSources.com. Andrew Gillum the Democrat candidate for governor speaks at a news conference on Saturday, Nov. 10, 2018, in Tallahassee, Fla. Gillum has withdrawn his concession in the Florida gubernatorial race following a recount. https://www.sunburynews.com/wp-content/uploads/sites/48/2018/11/web1_121758154-ad1e5608f21d49bcbea17a4daaf5186b.jpgAndrew Gillum the Democrat candidate for governor speaks at a news conference on Saturday, Nov. 10, 2018, in Tallahassee, Fla. Gillum has withdrawn his concession in the Florida gubernatorial race following a recount.